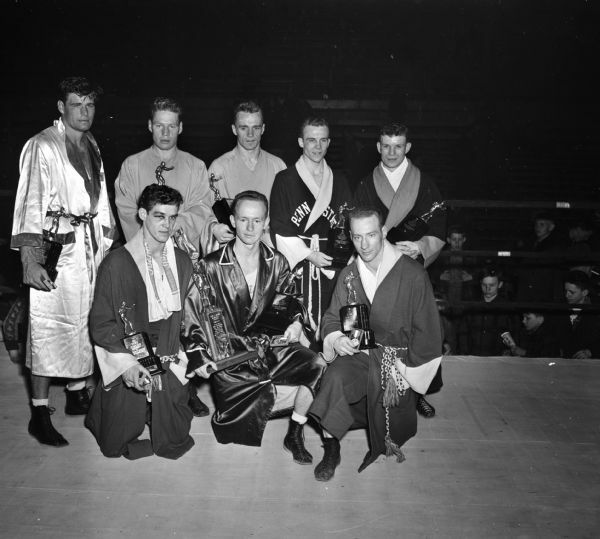 The eight NCAA National Boxing Champions with their trophies. The tournament was held at the University of Wisconsin-Madison Field House. Back row, left to right are: Art Saey, Miami; Laune Erichson, Idaho; Herb Carlson, Idaho; Glen Hawthorne, Penn State; and Gerald Auclair, Syracuse. Front row, left to right are John Lendenski, Wisconsin; Charles Davey, Michigan State; and Cliff Lutz, Wisconsin. One of three images. Published in the Wisconsin State Journal on March 31, 1947.